I love bubble bath and always have to have something in the bath when I go in, either bubble bath or a bath bomb and I have tried so many bubble baths that I really could do a review every day for a month just on bubble bath. I have been using this one for quite a while now and have really been enjoying it. I am definitely a lover of baths and almost despise showers unless it is a thousand degree like it has been in the UK this past week or two, because I run my baths as hot as humanly possible to sit in and that isn't a good idea in the heat! Th bottle is quite big and holds 500ml which means you will get a lot of baths from this which is always nice. I find the formula is a little bit thicker than some other bubble baths I have used but it is still so easy to pour out and use in the bath. I usually pour this under the running water and then swish it around in the water with my hand and it foams and bubbles up really well. The scent of this is the original pink fragrance of the line, this is described on the Boots website as 'Bubbled bergamot, strawberries and mandarin with floral and fruity mid notes, musk amber and warm vanilla.' I am not great with scents, but this does smell amazing and the original pink scent is a lovely one that I always enjoy using. I find this gives a great amount of bubbles in the bath and is really lovely to sink into when you have it in the water. It feels lovely and light in the water and doesn't make it feel heavy. The scent isn't too strong but you can still smell it throughout your bath, however it is light enough to use other scents to wash with so you do not feel restricted to Soap and Glory, even though they are lovely. 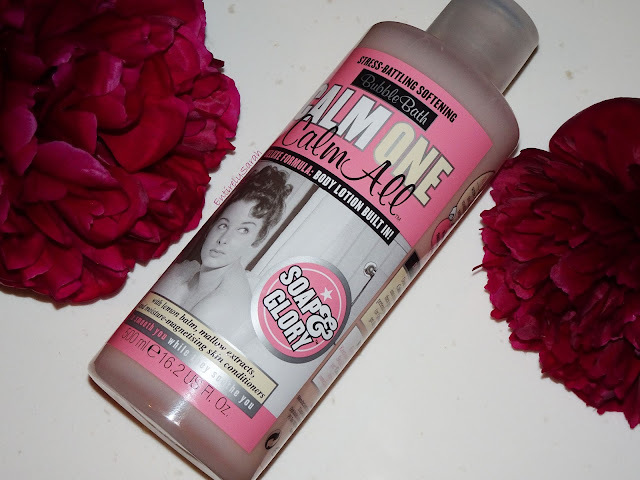 This is one of the nicer bubble baths I have tried and I love that I can get a matching shower gel as I sometimes like to be one of those people who coordinate scents when in the bath! I think this is a nice, mid range shower gel and at £6.50 for a full size, with minis being available in sets if you want to try this and a few others. You can find this on Boots here if you are interested in picking it up, and I would love to know your recommendations for bubble bath in the comments!